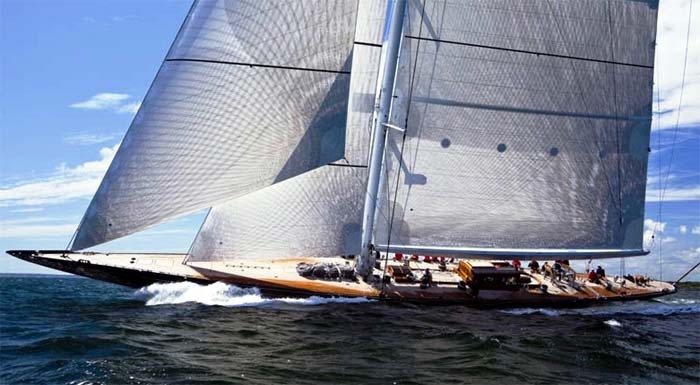 42.10m (138.11 ft) Royal Huisman J-Class "Hunaman"
There are only a handful of yacht builders in the world that can claim a historic lineage such as Royal Huisman. Founded in Vollenhove, Holland, in 1884 the Huisman family began building wooden yachts to meet the demanding conditions of the North Sea. While the materials have changed over the years, the concept of quality construction and uncompromising attention to detail has remained and is why Royal Huisman has a singularly unique reputation in the yacht building world. The Huisman yard is still family owned and received the award of the Royal Warrant in 1984, recognizing 100 years of quality and excellence. This is a highly prized accolade and one that is earned through generations of dedicated effort. Royal Huisman was born out of a long Dutch maritime heritage and has continually been at the forefront of innovative technologies and has demonstrated tremendous diversity in their builds. Paramount to Royal Huisman's success has been their R&D. All materials and processes are researched and independently analyzed, always with the doctrine of "quality up, quantity down". When ways are found to improve quality and ease demands on maintenance, it is immediately implemented and inherently becomes part of the new "yard standard". They are constantly moving forward, making improvements. Current focus of their R&D is on weight and power management. How to use aluminum construction in lighter, stronger ways � welding less, gluing more. Finding ways to make interiors lighter, with better sound insulating properties, and still be cost effective. Additionally, they are researching methods to improve propulsion and power supply systems. Micro-turbines, retractable drives and energy-recapture procedures are being developed. The focus is always on finding the right balance between innovation, its technical complexity and efficiency in incorporating new developments during the build process. They have a saying in the shipyard. "If we�ve been doing it for 10 years then we�ve been doing it for five years too long". As with all shipyards, projects of this magnitude are a collaboration of internal and external expertises. While Royal Huisman's internal design and engineering is superb, they frequently work with naval architects and designers which have contributed greatly to the broad range and refinement of their builds. Their "Intelligent Engineering" TM, which is a flexible approach to integrating a range of skills and resources both internal and external, allows them to bring "best practice" to each individual project. 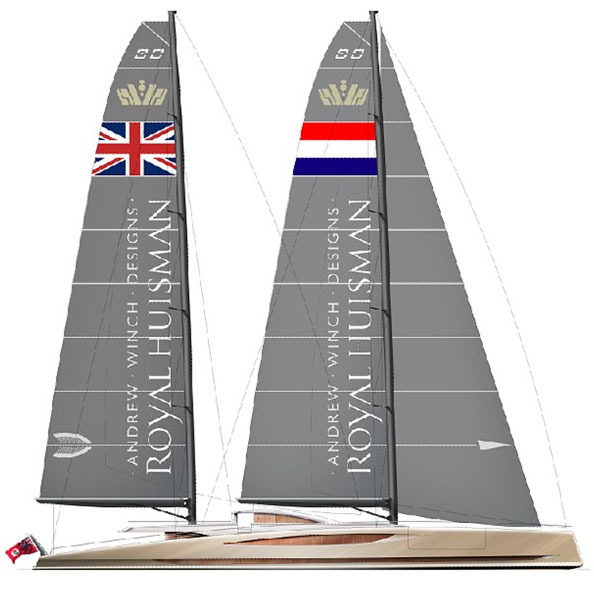 To highlight the range and diversity of Royal Huisman's exceptional craft I have chosen three designs here which I think show why they are arguably the most sophisticated builder of sailing yachts in the world. There have been a number of restorations as well as new builds in the J-Class over the last 25 years and "Hunaman" is one of the most recent to join the class association. She is a modern recreation of "Super-J" Class Endeavor II and was built by the owner of "Athena", another Huisman build, which holds the distinction as the largest three masted schooner in the world. "Hunaman" has been performance optimized to the class association rules by working with modern light weight materials. They gave her a generous sail area to displacement and improved the ballast to displacement ratio and righting moment over her ancestral sister ship. Dykstra Naval Architects were brought in to oversee the build of the hull in Alustar, an aluminum alloy with high corrosion and fatigue resistance, which allows for a lighter build. Her spars are carbon composite from Rondal and she sports the latest in sail technology from North Sails. Below decks, interior designer Pieter Beeldsnijder chose a very traditional approach using hand-polished French Walnut to create an ambience of a bygone era, while managing to incorporate all the latest accoutrements you would expect to see on today's superyachts. 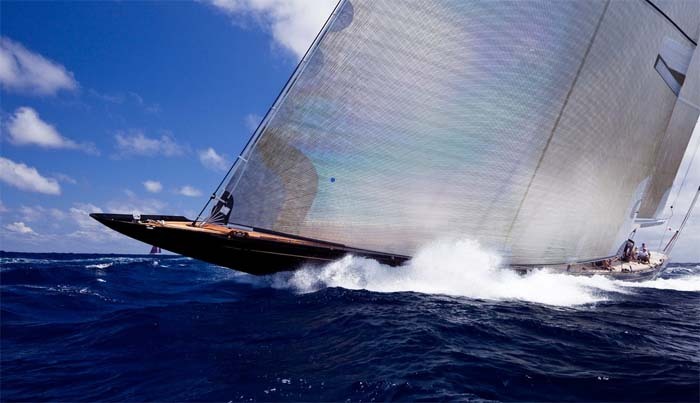 58.04m (190.49 ft) Royal Huisman "Etheral"
Performance ketch featuring exceptional technological innovation. While Ron Holland is known for designing outstanding performance sail yachts, and "Ethereal" is no exception, her sailing prowess is somewhat overshadowed by her technological innovation in power management. At the time of her launch she was heralded as the most technologically advanced superyacht ever built. Created by Ron Holland Design, Pieter Beeldsnijder Yacht Design and Royal Huisman, she is an elegant 58m world-cruising ketch with classic sheer, a contemporary house and the beautiful joinery throughout which has been the hallmark of Royal Huisman for over a century. But what makes "Ethereal" special is her highly advanced engineering features which represent a quantum shift in energy efficiency. "Ethereal" has a hybrid electro-mechanical propulsion system which is capable of charging the lithium polymer battery bank through the drive train under sail. She is able to run anchoring, sail and ship�s systems from stored electrical power with no need to depend on generators. Royal Huisman's engineering team has made huge strides in the efficient use of insulation, lighting, appliances, water making and air conditioning. Additionally, the ability to generate power from the main engines increases fuel efficiency and reduces maintenance. 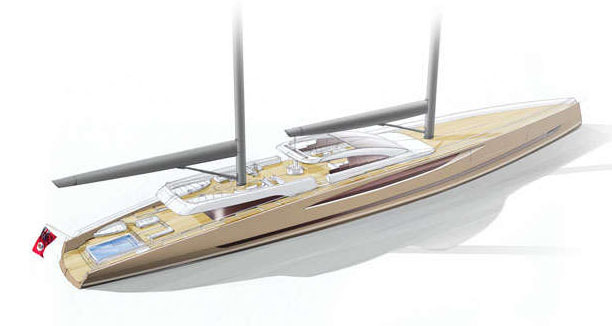 The "DART 80" from Andrew Winch and Royal Huisman, represents the most forward thinking concept design to date. Descriptions such as contemporary or modern don't really capture what this design is all about. 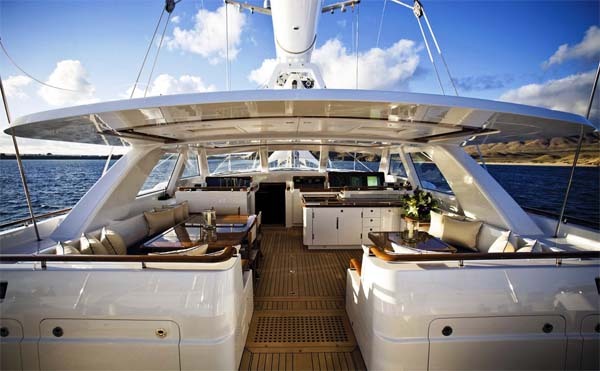 The design brief's focus for the DART was to build a highly efficient, luxurious yacht, which at the same time would be in tune with her environment. "At one with nature" if you will. From her reverse bow to her convex sheer, every square inch is leading edge. The DART has been highly optimized both in sailing performance and energy management. 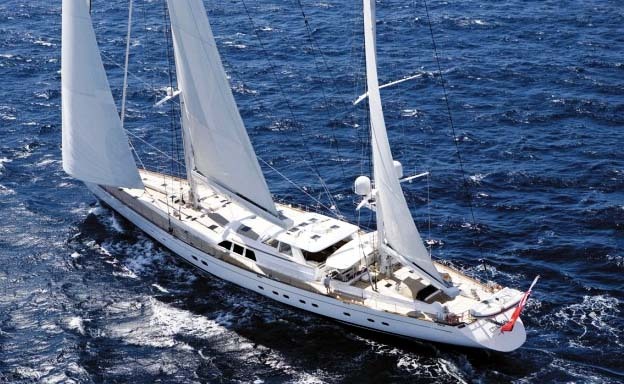 She has a very low wetted surface area hull with high aspect foils and a centerboard keel configuration. Stability is enhanced by the relatively low center of gravity due to her low profile and internal ballast. DART has a twin masted sail plan. Both mainsails are square top cut with battened car systems and store on Rondal furling booms which are double sheeted for ease of handling. The jib is led to captive winches for safety and to keep the decks clear. Reaching spinnakers which furl are stored below decks on large pulley systems. She has twin engines with drive trains which are equipped with integrated shaft generators/ electric motors. This allows for power generation under sail as well as the ability to access stored power for hybrid, silent motoring. 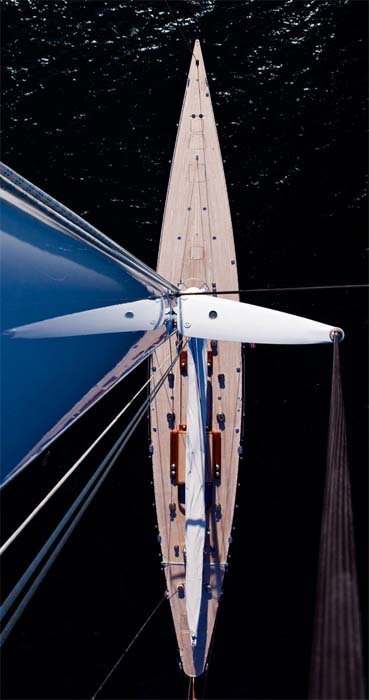 These designs are just a few examples of the incredible range that Royal Huisman is capable of. As of this writing there are several other projects in process which will, I am sure, be as stunning as all of their previous efforts. They seem to have found the perfect balance between art and science which everyone strives for in their creations and few achieve. I don't think there is a more thoughtful, imaginative or dedicated builder in our industry and one more deserving of the "Royal Warrant".